Solar cells: Coming to a window near you? The solar cells are translucent, so they could be made into windows. Technology often described as "artificial photosynthesis"
(CNN) -- A professor who invented low-cost solar cells that may be incorporated into energy-producing windows has been awarded the Millennium Technology Prize. Finland's Technology Academy on Wednesday awarded Swiss professor Michael Gratzel with the prize, which is said to be the biggest award in the field of technology. The award, which is given as 800,000 Euros, amounts to about $960,000. The groups says "Gratzel cells" are significant because they are cheaper than other types of technology that seek to capture energy from the sun. "Gratzel's innovation is likely to have an important role in low-cost, large-scale solutions for renewable energy," Ainomaija Haarla, president of Finland's Technology Academy, says in a prepared news release on the group's website. The Technology Academy says this new form of solar cell is still "still in relatively early stages of development," but has made its way into some consumer products. Gratzel says windows could be made into solar panels. You would be able to see through them, but they may have a slight tint because of the solar cells. "You could think that the glass of all high-rises in New York would be electricity-generating panels," he told BBC News. As solar cells become cheaper to produce, they'll also start showing up in other places, too, Gratzel says in a YouTube video about his inventions. 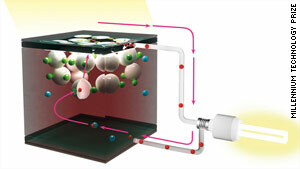 "What we see more and more will be that solar cells will become integrated in the living space," he says in the video. Solar cells "could be a piece of furniture. They could be the keyboards ... It could be put in as a lamp on the street -- autonomous lamps that have no power supply." He draws inspiration from the way plants turn light into energy. "I was always intrigued with natural photosynthesis -- the way the plant uses molecules to generate charges and separate those changes," he says in the YouTube clip, which was produced for the Millennium Technology Prize. "Nature then uses those charges to make chemicals out of water, oxygen and out of CO2. I was interested to try to mimic the primary charge separation step." Gratzel says his panels are "the best in terms of efficiency in ambient light." The academy that awarded the prize said, "the technology, often described as 'artificial photosynthesis,' is a promising alternative to standard silicon photovoltaics," which are more expensive to make.